What does it mean to be served? What happens after the trial in Small Claims or District court? 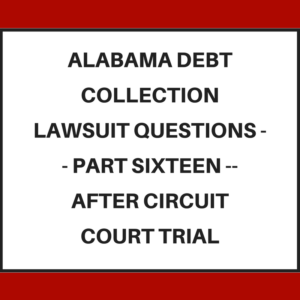 Our topic today is after you try your debt collection case in Alabama Circuit court, what happens? How do you know if you won or lost? Who can appeal? What happens if there is an appeal or not an appeal? I hope you find this helpful and let’s jump right into your questions. WHAT HAPPENS AFTER THE TRIAL IN CIRCUIT COURT? The ruling will be in the form of a judgment – either for the Plaintiff (who sued you) or in favor of the Defendant (you – the person sued). And you get that through the mail. Some judges will tell you right after the trial while you are still in the courtroom but most will want to think about it and then issue a ruling. I’m not going to cover every exception. Here are the basic options. You can appeal it or you can ask the judge to reconsider what’s called a motion to alter, amend, or vacate, if you have valid reasons for that. An appeal is to Montgomery in the Alabama Court of Civil Appeals or the Alabama Supreme Court. The idea is to have the appellate court rule that the judge in your case made an error that is significant enough to overrule the judgment. And either rule in your favor or send it back for a new trial in front of the same judge. To be blunt, appeals in this area after a trial are very rarely successful. Your other option is to ask the judge who ruled against you to change his or her mind. This is called “vacating” or “altering/amending” the judgment. While it happens, most of the time you have no new arguments and the judge has already considered the law and facts. So this rarely is successful but it is an option. It normally means that you do not owe that debt, and so that’s a great ruling in your regard. This is the perfect result when you try your case. What we spoke about previously – appealing or asking the judge to set aside the ruling – is available to the Plaintiff debt collector who sued you. It is about the same result usually – the one appealing or asking the judge to set aside the ruling after a Circuit court collection trial is rarely successful. If you lose and do not appeal, then the judgment/ruling is final and established. You owe the debt and the Plaintiff debt buyer can start executing on the judgment – garnishment, etc. It is very difficult to ever undo a judgment that has not been appealed. In fact, almost impossible. This is the same thing from the other perspective – the judgment is final and it means you do not owe the debt collector this money. So the debt collector can’t call you to collect this debt. Or credit report you owe the debt. Because if the judge said, by ruling in your favor, that you do not owe the debt, then there is nothing to collect on. No debt to credit report. This is the best outcome – you won the trial and there was no appeal. What is coming up next in our series? We are getting close to the end — the final part is part seventeen where we talk about, “So what do you do next?” You have learned all this information, so what do you do with it? Thank you for reading this and I hope these questions — and answers — are helpful to you. Feel free to call us if you have a question about a collection lawsuit in Alabama — you can call us at 205-879-2447 or fill out our contact form and we’ll email or call you right back. Look forward to talking to you soon! PS — You may also want to get our checklist to use when you have been sued by a debt collector in Alabama — it is free for you to download.